Andy Rouse, aviation photographer? What’s that all about? Well it’s about following your passion and never allowing yourself to be pigeon holed. A year ago I decided that my calling to the world of aviation had returned and that I had to follow it. I’d blocked it for many years, mainly due to my failing to be a pilot on several attempts, and had always returned and dabbled in it. Wildlife though has dominated my professional life and I love it - I still get such a thrill from getting close to animals and watching them in their daily lives. Unfortunately, the negative and nasty side of the business has got far worse, with petty jealousy, sniping and some photographer’s willingness to do anything to get a shot. Couple that with the hard fact that to be in the public eye all the time means you have to dedicate your life to it (there will be pros reading this now that work 12 hour days for most days of the week without a social life or holiday) and perhaps you will see why I have started to take a back seat in this world. With a young daughter whom I love very much, I just don’t have the time to spend endless days and nights away in the UK photographing wildlife. So for the foreseeable future I have really cut down my UK wildlife photography to just a few species that I really love, and have limited my foreign trips to 4 per year (again only on subjects that I really love). This means I have more time for a great home life and more time for aviation, as with aviation I am home in the evenings. I’ve always been a social kind of guy, always had great friends and always valued the social site of the business. It’s one reason why I started FotoBuzz with experienced journalist and photographer Andrew James, to bring this kind of like-minded photographer together. It’s been successful as we have a wonderful crowd but it’s also taught me that there is a world outside wildlife photography, and now I run workshops on steam photography and aviation with my friend Neil at Timeline Events. Notice the trend here, I only work with friends, it’s been with me my whole business life. I’m really loving aviation as it’s so friendly. I work with the wonderful Aviation Photocrew who have introduced me to lots of nice photographers. In the past year I have built a great network of aircrew too, and have worked already with several air forces on a one to one basis. I’m working on my aviation as a professional, but I’m selling into a different market than most, as I didn’t want to annoy the existing pros in the business who are top guys. It’s nice being in an industry where I am not known, where I must start from the bottom and let my pictures do the talking. I’m finding it a challenge and loving it. I’ve done quite well too in my first year, with aviation pictures of mine being published on the Hong Kong metro as well as in the worldwide press. Pictures of mine hang on several boardroom walls, both at fighter bases and bosses of big aviation companies and I’ve shot a few commissioned jobs for newspapers too. I’m a proud member of the Navy Wings Advisory Board too, helping keep our vintage naval heritage in the public eye with our wonderful aircraft. As you can see I have really jumped at it and as I said earlier, it’s my images that have done the talking for me. Alright - let’s start with the first five images, with the second batch to follow in a post on this blog in August. The first two images really started everything off for me and again you will see that the friend’s element is strong within these…. A tough shot but when we saw the old style hangar we really wanted this atmospheric shot. At the time I was using the Canon EOS 7D Mark II on this trip so I put the 18-135mm lens on which gave me the perfect choice for composition. Nigel is an expert at light painting so I watched and learnt as he did it, helping out and lighting up the inside like an Ibiza club night. We placed a car at the opening of the hangar and used the headlights to create the orange glow, a 20 second exposure did the rest. I processed it hard using a HDR plug-in to ensure we had all the details. I really like this image as it’s different from the norm and I put it in here for one reason, to show that no matter how good you think you are at photography there is always something you can learn. The weather was totally pants on this day but as a wildlife photographer I have learnt not to worry about that as it can yield some atmospheric shots. So, with my safety guy, I positioned myself at the end of the runway as the MiG 29’s geared for take-off. I used a EF 500mm f/4.0L USM IS MK II lens with a 2x converter to get them just as they lifted off with the wheels up. The gloom really helped with this shot as the runway lights really stand out well, you can see the raw power of the MiG 29 as it powers from the runway. Shot at ISO 3200 this was virtually the last image I shot with the EOS-1D X as I had the EOS-1D X Mark II the next week to test. I realised then that I was pushing the 1DX file to the absolute limit so the arrival of the amazing 1DX II was very timely indeed. As well as Jamie being responsible for firing my passion with aviation, Nigel has helped too by taking me to see low level flying at the Mac Loop and really getting me into it. Now we treat the Mac Loop as a social day to catch up, we have our own places to go and avoid the crowds. You never know what is going to turn up at the Mac Loop, for me that makes it so attractive as the final images are down to your skill and precision with AF. It’s easy to fall into the same old trap with images so I do try to shoot wider or to shoot slower as you see here, a Hawk T1 at 1/125th second to give this lovely effect. One of my most successful aviation images of the past year this one and it changed my sometimes negative view of Hawks in the loop! One of the most amazing air to airs that I will ever do in my life, thanks to Eric for allowing me onto a plane full of much more experienced people. I remember seeing the Vulcan at airshows as a kid - myself and my parents loved seeing them flying over the crowd and hearing the thundering howl. So this a2a shoot meant a lot to me as my parents are sadly no longer here and I certainly had a tear in my eye when I first saw her through the clouds. She was truly beautiful, cutting through the clouds and looking like an aviation work of art. Yes, she was designed for a purpose, but just like the Sea Vixen she was designed to look good too. The holy grail shot for this shoot was to get her alongside Beachy Head, the clouds did everything they could to hide it from us but on one pass she turned right above the lighthouse and bingo there was the shot. The Daily Mail published it the next day to a tremendous reaction and to this day it’s my most successful limited edition aviation print. A memory that will live on forever!!!! OK, that’s the first 5 - see you next month for the next five! 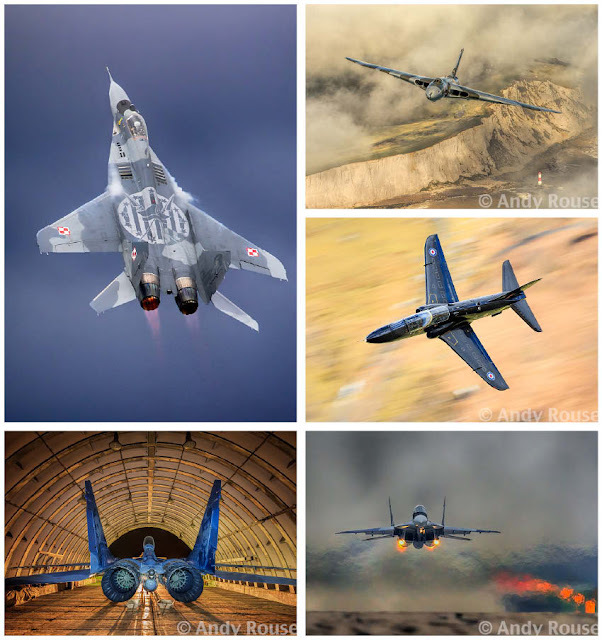 Andy Rouse is a multi-award winning professional wildlife and aviation photographer. He loves to shoot edgy and atmospheric imagery and has always been known for pushing his photography to the next level. He runs workshops for photographers, leads expeditions across the globe and was co-founder of the online camera community FotoBuzz. He is proud to be an Ambassador for 21st Century Tiger and undertakes to support conservation initiatives wherever possible. On top of this, he is the author of numerous critically acclaimed books and has appeared on many television programmes worldwide. As well as appearing at industry trade shows and conferences, presenting his photography theatre show, he is a trusted Canon Europe Explorer and now also a Park Cameras Ambassador.